Whether you want your conservatory for additional space, a serene place to relax in or somewhere to entertain your friends – we can transfer your house into a home! We offer valuable advice and information so that you can chose the best conservatory to suit your needs, your pocket and your property! 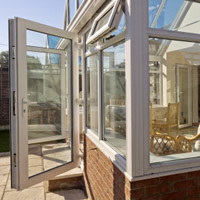 As all of our conservatories are made on a truly individual basis, this gives you the option of choosing whichever frame type you would like – from the traditional timber frame, to the usual uPVC frame and to the new ultra-modern aluminium frame. The benefits of having a glass roof are reduction in noise levels, the room allows maximum amount of natural light in, tinted glass reduces the glare from the sun, self-cleaning glass reduces the cost of window cleaning and enhances the view. This brings the outside in! All of our conservatories also come in a range of different colour schemes. All you need to do is sit back, relax and wait for the incredible transformation! If you already have a conservatory, why don’t you transform it by changing the roof style to glass or tiles? This can dramatically change the appearance and aura of your room.